Invasive species are animals, plants, or microbes which were introduced (intentionally or unintentionally) from their original habitat to a new environment, where they spread aggressively and often cause a negative impact on native ecosystems, for example, by competing for food sources, transmitting diseases, or feeding on native species. Famous examples are the spread of European rabbits in Australia, the kudzu vine in the Southeastern US, and the Burmese Python in Florida. According to the eminent ecologist Daniel Simberloff from the University of Tennessee, invasive introduced species rank second only to habitat destruction compared to other threats to biodiversity. Lesser-known to the general public than invasive plants and animals, but often even more devastating, are invasive microbes, such as fungi, oomycetes, and bacteria. In recent years, the worldwide spread of a chytrid fungus was responsible for the significant decline of amphibian populations, and a new invasive fungus from Europe killed millions of bats in the USA already, leading to increased mosquito populations in certain areas. In the 19th century, a plant pathogenic microorganism called Phytophthora infestans reached Ireland and devastated the potato fields. The total loss of the most important crop plant resulted in the infamous Irish potato famine, during which approximately 1 million people died and a million more emigrated from the island. In the early 20th century, a fungus from East Asia was introduced to the US on Japanese chestnut trees that were planted as ornamental trees. 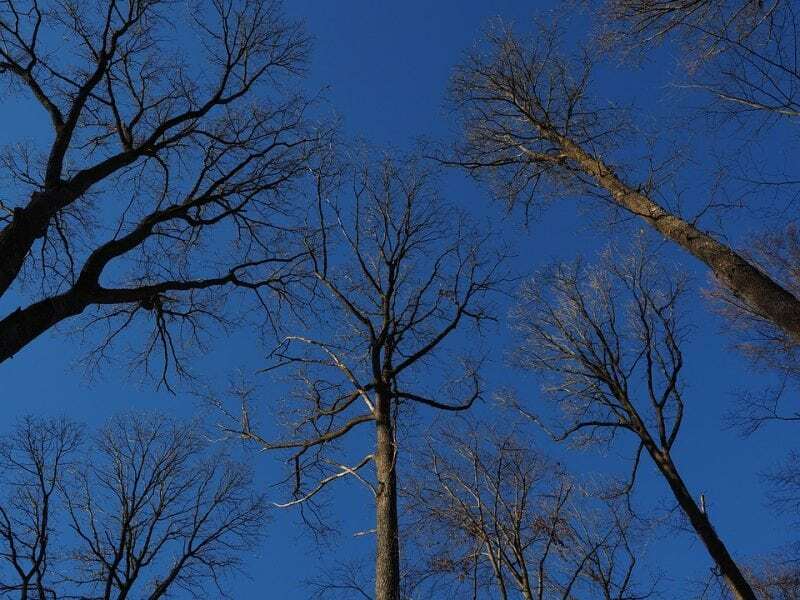 The fungus Cryphonectria parasitica quickly escaped the cities and invaded the hardwood forests in the Eastern US, wiping out all native American chestnuts and changing the forest composition forever. Recently, a new invasive forest pathogen was identified in Coastal California. Phytophthora ramorum is closely related to the potato-killer P. infestans and many other aggressive plant pathogens. P. ramorum causes Sudden Oak Death (SOD) and kills several native tree species, such as Coast live oak and tanoak, by infesting the trunk and destroying the vascular tissue which leads to massive water stress and wilting. 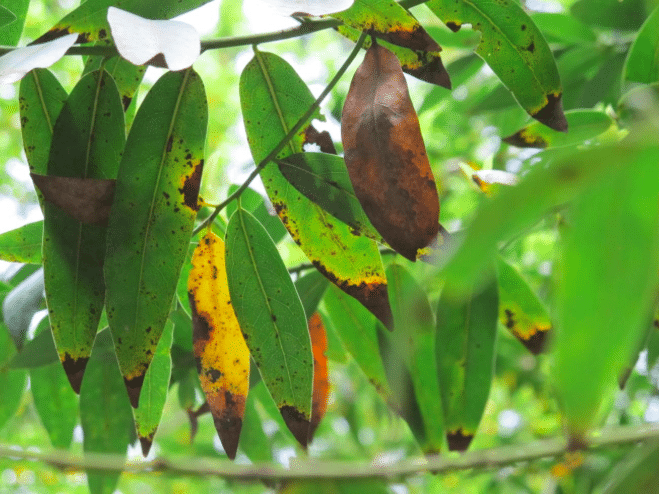 In addition, on many other host plants P. ramorum causes only a mild form of leaf infection called ramorum blight, which doesn’t harm the plant significantly. Unfortunately, these “secondary” hosts play an important role for inoculum production and spread of the disease. Little is known about the origin of P. ramorum. New research indicates that the pathogen might be native to Vietnam or other areas in Southeast Asia, from which it spread to Europe and North America. In Coastal California it found perfect climatic conditions and an abundance of susceptible host plants, leading to a very fast invasion of native woodlands where it killed hundreds of thousands of trees. The movement of infested ornamental plants by the nursery industry played an important role for the spread of P. ramorum to new areas, and P. ramorum has been detected on numerous popular ornamental plants in nurseries and landscaped settings, such as rhododendron, camellia, and viburnum. Strict federal and state regulations were introduced to lower the risk of P. ramorum transmission to other states by plant trade, and as a consequence, many nurseries had to improve their production standards and implement Best Management Practices for pathogen control. Funded through a grant by the US Department of Agriculture, a research nursery was established in San Rafael, CA, to study P. ramorum and other invasive pathogens under conditions very similar to commercial nurseries. Research at this National Ornamentals Research Site at Dominican University of California (NORS-DUC) is aimed to develop and evaluate management option for pathogens of ornamental plants in collaborative projects with partners from universities and governmental research centers. P. ramorum can produce resting structures, so-called chlamydospores, which survive for a substantial period of time in the soil; therefore, remediation of infested nursery soil is the focus of several studies at NORS-DUC. Heat treatment, e.g. by steaming and solarization, was shown to inactivate P. ramorum in the soil. Another environmentally- friendly method to manage pathogens is biological control, using beneficial soil micro-organism to suppress the pathogens. Several soil-dwelling fungi are known, which can lower population densities of plant pathogens and consequently improve plant growth. A number of biopesticides using beneficial micro-organism were already developed and used extensively to control plant diseases. The mechanisms used by these beneficial fungi to control the plant pathogens are not always known but might include direct parasitism, induction of plant defense mechanism and competition for nutrients, including sequestration, conversion, or enhanced uptake. 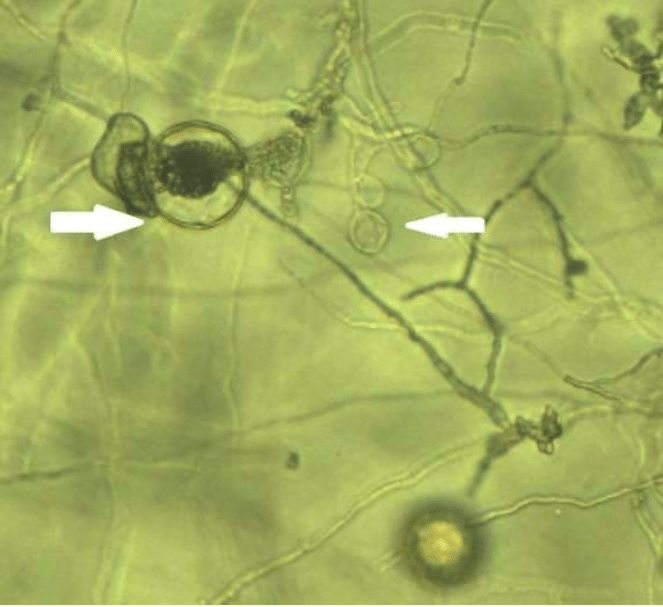 The fungus Trichoderma asperellum was shown in lab experiments to actively grow towards P. ramorum, invade its tissue, and feed on it. 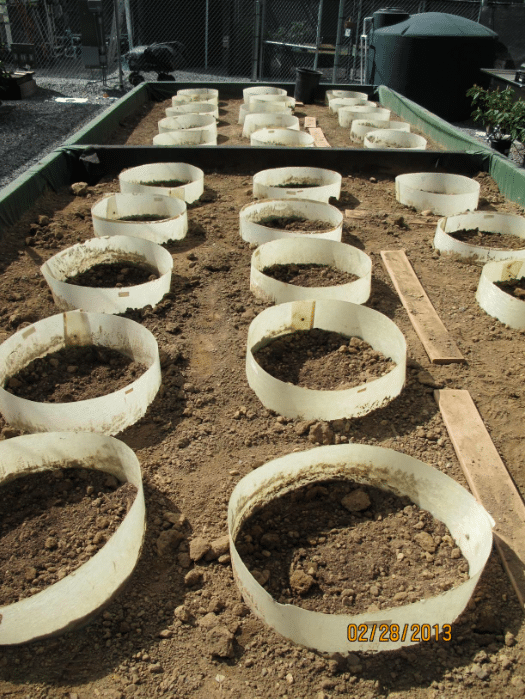 In a series of field experiments at NORS-DUC over several years, a team led by Dr. Tim Widmer from the USDA demonstrated that T. asperellum can lower the density of P. ramorum in nursery soil significantly. Microplots were inserted into soil that was artificially-infested with P. ramorum and then treated with different formulations of T. asperellum isolate 04-22. Soil samples were taken bi-weekly and tested for the presence and abundance of P. ramorum by distributing a soil suspension on selective medium. After twelve weeks, in the microplots treated with the bio-control agent, P. ramorum was reduced to non-detectable levels. In a different trial at a commercial nursery in California, soil naturally infested with P. ramorum was also treated with T. asperellum. After five weeks, soil samples were collected and tested for the presence of P. ramorum using a baiting method with rhododendron leaves. No P. ramorum was detected in the treated area. The results indicate that T. asperellum can be used as a biological control agent to control the invasive pathogen P. ramorum in open nursery soils. First steps to develop a commercial product were already taken by Dr. Widmer in collaboration with a biopesticide company. This research project was described in the article entitled, Remediation of Phytophthora ramorum-infested soil with Trichoderma asperellum isolate 04-22 under ornamental nursery conditions, recently published in the journal Biological Control. This work was conducted by Timothy L. Widmer from the Foreign Disease and Weed Science Research Unit, USDA-ARS, Sheila Johnson-Brousseau, Sibdas Ghosh, Wolfgang Schweigkofler, Supriya Sharma, and Karen Suslow from the Dominican University of California, and Kathleen Kosta from the California Department of Food and Agriculture. Grünwald, N. J., Garbelotto, M., Goss, E. M., Heungens, K.,and Prospero, S. 2012. Emergence of the sudden oak death pathogen Phytophthora ramorum. Trends in Microbiology 20: 131-138. Schweigkofler W., Kosta K., Huffman V., Sharma S., Suslow K., and Ghosh S. 2014. 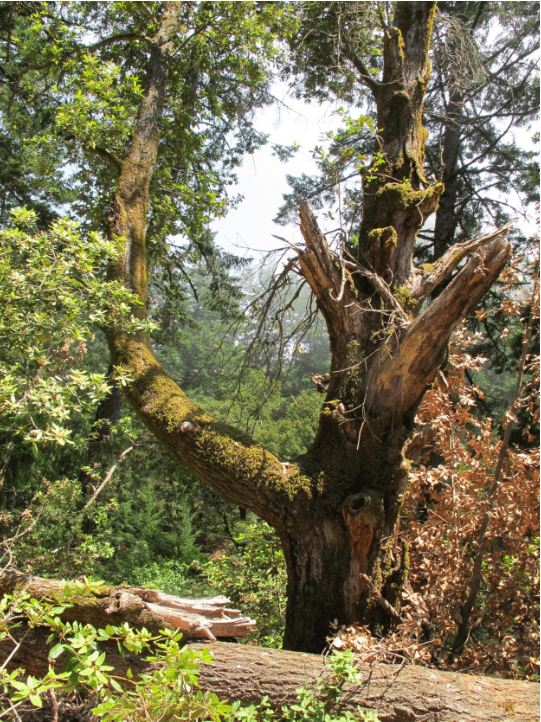 Steaming inactivates Phytophthora ramorum, causal agent of Sudden Oak Death and ramorum blight, from infested nursery soils in California. Plant Health Progress doi:10.1094/PHp-RS-13-0111. Funahashi, F., and Parke, J. L. 2016. Effects of Soil Solarization and Trichoderma asperellum on Soilborne Inoculum of Phytophthora ramorum and Phytophthora pini in Container Nurseries. Plant Disease 100: 438-443. Widmer, T.L., 2014. Screening Trichoderma species for biological control activity against Phytophthora ramorum in soil. Biological Control 79, 43-48. Wolfgang Schweigkofler is a research assistant professor at the Dominican University of California. His major research goals are: i) to detect and identify plant pathogens, ii) to study the life-cycle, biology and spreading pattern of the microbes and iii) to control plant pathogens using environmentally friendly and sustainable methods.